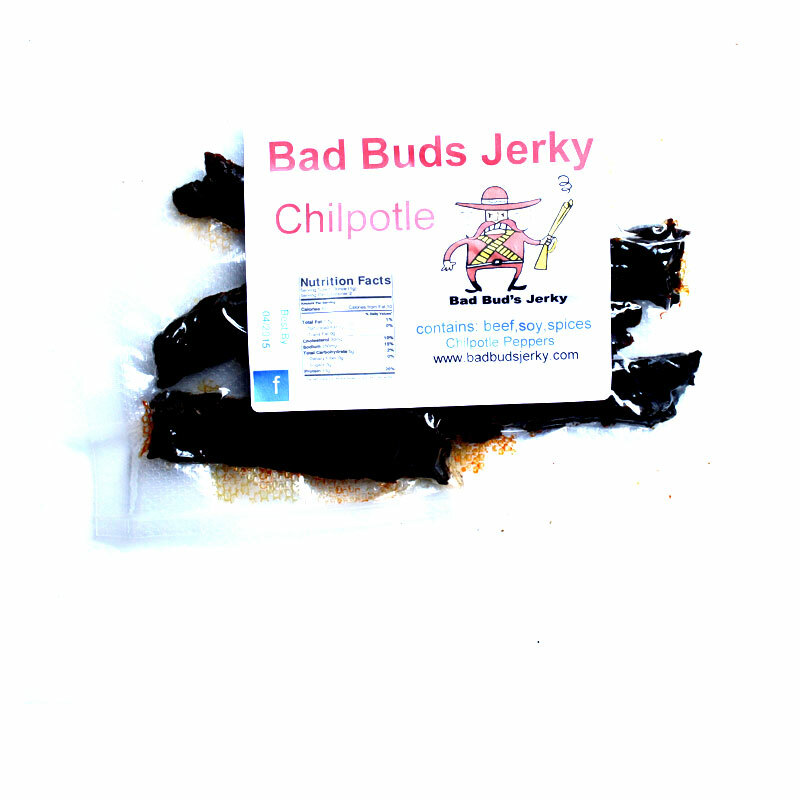 The newest flavor from Bad Buds Bull Jerky is this Chipotle Beef Jerky. This new Chipotle variety is described as being made from chipotle peppers and rice wine vinegar. It brings the total number of jerky varieties offered by Bad Buds to six. Beef, worcestershire, soy, rice wine vinegar, chipotle peppers, onion powder, garlic powder. The first thing I taste from the surface of these pieces is a combination of heavy sweetness and a saucy flavor comparable to soy sauce with garlic and onion. I can feel light bit of heat in the back of my mouth. The chewing brings in more of the soy sauce with perhaps hints of worcestershire. I can also taste subtle notes of chipotle and a light amount of the vinegar. For being marketed as a "Chipotle" beef jerky, it holds up. I get a light flavor of the dried, smoked chile peppers that I always expect when reviewing a chipotle jerky. I don't get much heat at all aside from a light bit. The chipotle flavor is definitely in there and noticeable, but it tends to be overwhelmed by the much stronger sweet and soy sauce flavors. Otherwise, this jerky largely tastes like a strongly sweetened soy sauce jerky, but with a significant garlic and onion seasoning. The worcestershire and the chipotle come in light amounts, just enough to affect the overall flavor, along with a light vinegar tanginess in the chewing. The level of heat in this ranks as "Mild Medium" on my personal heat scale (level 2 out of 5). I don't pick much of the natural meat flavors in this, not like in some of the other varieties offered by Bad Buds, though I can detect a very light taste at the tail end of chewing. This is a dry jerky with a slightly moist surface feel. These strips are very flexible, maybe just a touch of rubbery feel. Biting off pieces takes little bit of work while chewing is moderately tough. The chewing texture starts out feeling chewy, requiring some effort to get through, but starts to break apart and soon softens up into a meaty feel. By the time its chewed down to a soft mass, it feel very steak like, perhaps cooked medium-well. I don't see any bits or streaks of fat on these strips, but I do taste some fatty flavor. I'm not getting much of any stringiness in the chewing. As far as handling goes, my fingertips pick up light oily and sticky residue, enough to require a licking and wiping before touching the keyboard. Bad Buds Bull Jerky sells this Chipotle jerky from its website at a price of $4.50 for a 2.0oz package. It's free shipping if you buy $25.00 of jerky or more. So, if you bought 6 packages, it works out to a total of $27.00. That's the same as $2.25 per ounce. 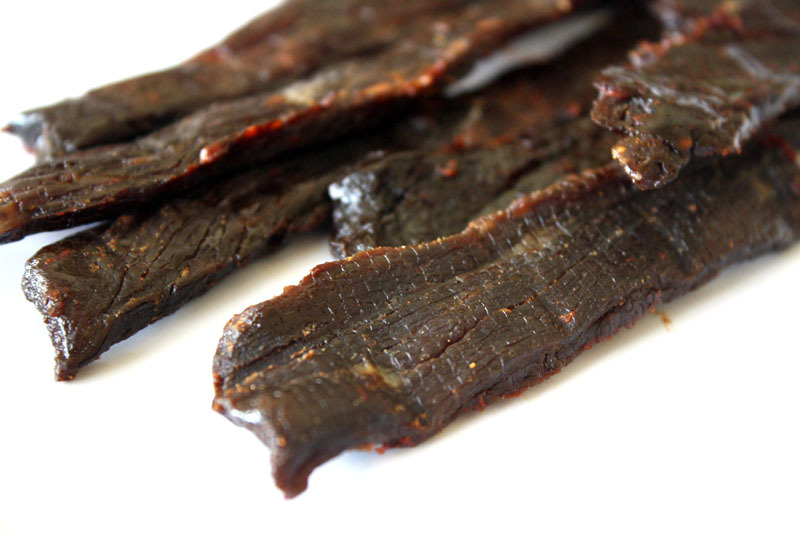 For general jerky snacking purposes, at the $2.25 per ounce price, it's a great value. That's priced about the same or slightly higher than the major jerky brands sold in stores, yet tastes a lot better and offers much better meat consistency and chewing. 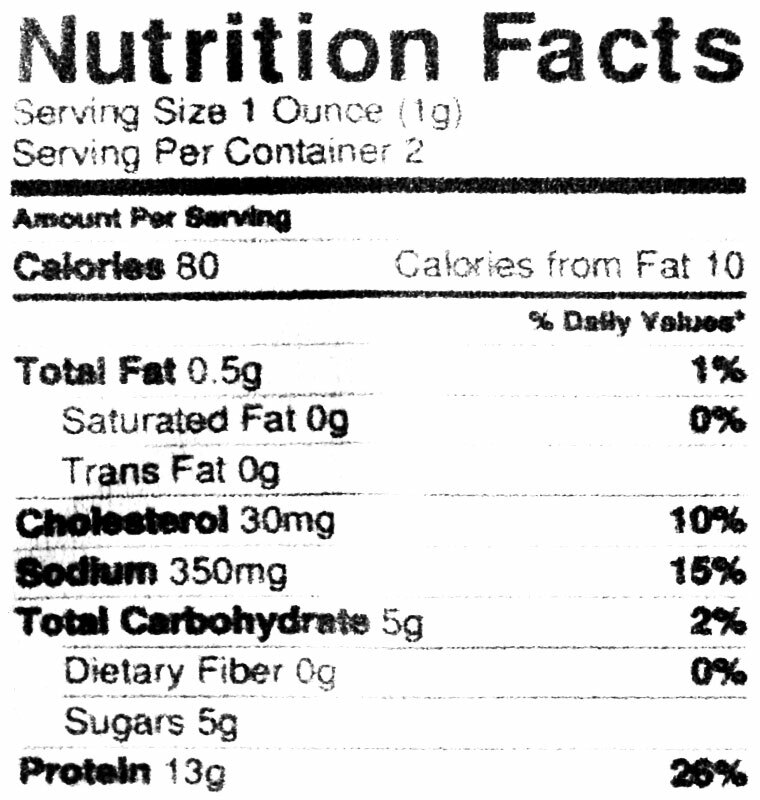 As a Chipotle beef jerky, at the same $2.25 per ounce price, it's a fair value. I'm getting a light chipotle flavor, though not quite as much as I would like to get. The heat is also rather light. This Chipotle beef jerky from Bad Buds doles out a light chipotle flavor and a light level of heat against a savory combination of sweet, soy sauce, and garlic & onion. Throw in some worcestershire and vinegar, and it really makes for a lively, tantalizing chewing. I found the characteristic chipotle flavor to be rather light in this, but largely because the heavier sweet, soy sauce and garlic & onion were far more pronounced. Just based on its own merits, however, this is still a very snackable flavor that you'll find difficult to stop eating. Think of the confluence barbecue, Asian, and south west flavors merging together into a ménage à trois of meat snacking love. The meat consistency is very characteristic of Bad Buds brand, chewy, but meaty, steak-like chewing with very little fat, but interestingly little stringiness than what I've found previously.